Pulse/Quartet collates two previously performed pieces, Quartet and Pulse. The former was performed in 2013 by the Colin Currie Group, and the latter was played in 2015 by the International Contemporary Ensemble. (Both ensembles replayed the compositions for the album.) Reich has described Quartet as one of his more complex pieces. "It frequently changes key," he says, "and often breaks off continuity to pause or take up new material. Though the parts are not unduly difficult, it calls for a high level of ensemble virtuosity." 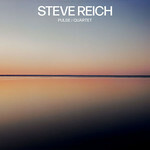 Of Pulse, a "reaction" to Quartet, Reich said: "In Pulse I felt the need to stay put harmonically and spin out smoother wind and string melodic lines in canon over a constant pulse in the electric bass and or piano. [...] All in all, a calmer more contemplative piece."